It’s no secret that Southern folks are fond of casseroles, preferably those involving cream of something soup, but there’s one Southern delicacy y’all yankee types might have missed out on: Frito Pie. 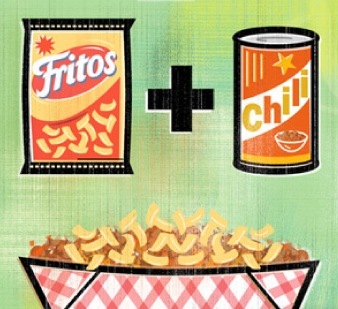 Do not be tricked into accepting a soggy substitute such as “Doritos Casserole” or “Tostitos Stuffing.” Frito Pie can only be made with the crunch-retaining magic of Fritos. I must admit, it was a sad day when I discovered Sonic no longer traffics in Frito Pies. Chili-cheese tater tots will suffice in a pinch, but they lack a certain something. Namely Fritos. Put the Fritos in a casserole dish. Top with chili and cheese. Bake at 350 degrees till nice and bubbly. You could also add ground beef, onions, and jalapenos if you wanted to be extra fancy. ← 18. Pick-up Trucks: Tonka Toys for Grownups? The Sonic in Tacoma has roller skating servers. And just down the street (also on 6th Ave) you can get real Frito Pie and Moon Pies too! The south has risen to the North!